Like tall buildings, helipads and bridges, these colossal structures must be marked with lights in order to ensure safety and decrease the possibility of collisions with planes, helicopters and vessels. Lighting requirements for offshore wind farms are similar with aviation operations, marine locations and onshore wind farms. To start, LED obstruction lights or beacons are used to mark the structures, which also serve as warning lights for planes navigating in the area. Furthermore, the lamps must cater to search and rescue aircrafts. In this case, LED units used to mark wind turbines are medium intensity lights (red and/or white) and low intensity lights (greed and/or red). Turbines requiring both red and white could use a dual beacon to reduce space requirements. Interestingly, low intensity infrared lights may be required to support nighttime operations. Such units are designed to support aircraft operators equipped with night vision goggles. This type of light is typically installed with (visible) medium or low intensity lights. From a compliance perspective, lights for offshore wind farms should adhere to the Federal Aviation Administration (FAA) or the International Civil Aviation Organization (ICAO), depending on the applicable jurisdiction of the location. The remote nature, coupled with direct exposure to natural sunlight, makes offshore wind farms viable candidates for solar-powered lighting systems. A crucial benefit that comes with solar lights for offshore wind farms is decreased cost in lighting installations and almost no reliance on centralized power. 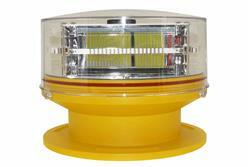 An example of a solar-powered lamp for wind turbines in offshore locations includes a low intensity LED obstruction unit applicable to temporary marking requirements.